These ball bearings have a spherical surface with a point at which the center of the outer ring track surface matches the center of the bearing, and the inner ring has a two-row track groove. The balls, cage, and inner ring are able to tilt freely to a degree with respect to the outer ring, and rotate. As such, misalignment caused by processing errors in the axis or housing, or by mounting of the bearing, is automatically corrected. 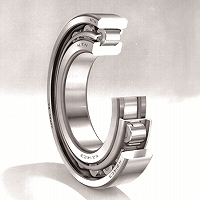 However, as the capacity to bear axial loads is not so great, the bearings are not suited to locations with large axial loads. The bearings are often used in applications such as drive shafts, as mounting and un-mounting are easy if an adapter is used for bearings with tapered bore calibers. These use rollers as the rolling elements and have a high load capacity. The rollers are guided by the ribs of the inner or outer ring. 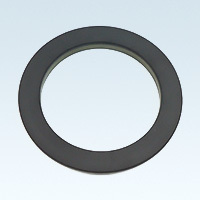 The inner and outer rings can be separated to facilitate assembly, and both can be fitted tightly. 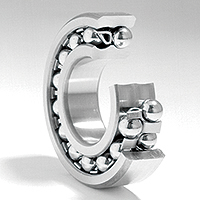 On types with no ribs, either the inner or the outer ring can move freely in the axial direction, making cylindrical roller bearings ideal for use in free side bearings that absorb shaft expansion. 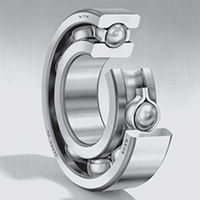 On types with ribs, the bearing can bear a slight axial load between the roller end surfaces and the ribs. Cylindrical roller bearings include the HT type that modifies the shape of roller end surfaces and ribs to increase axial load capacity, and the E type that has a special internal design to increase radial load capacity. The E type is standard for small-diameter sizes. This is a ring-shaped part developed to detect the angle of mainly robot joints and enables angle information for the absolute angle to be outputted when using it in combination with a dedicated sensor. In addition to it having superior environment resistance when compared to optical type sensors, it also contributes to more compact devices since it is thin and lightweight. Furthermore, it is also easy to apply for robot joints due to its hollow shape which is large enough to allow cables and such items to pass through internally. Two types, a radial type and axial type, are available with different detection directions.